VERVAET, F.L.J., 2018. The living Olividae species as described by Pierre-Louis Duclos. The recent olivoidean taxa described by the French conchologist Pierre-Louis Duclos (1783-1853) are reviewed and discussed. Olivella rosolina (Duclos, 1835) and Oliva miriadina Duclos, 1835 are reintroduced as valid species. Olivella mica (Duclos, 1835) is a senior synonym and the valid name of both Olivella dealbata (Reeve, 1850) and Olivella monilifera (Reeve, 1850). Olivella mandarina (Duclos, 1835) is a senior synonym and the valid name of Olivella fortunei var. japonica Pilsbry, 1895. Olivella alectona (Duclos, 1835) is a senior synonym and the valid name of Olivella pedroana (Conrad, 1855). Olivella selasia (Duclos, 1835) should be considered as a junior synonym of Olivella mandarina (Duclos, 1835). Oliva ozodona Duclos, 1835 is a senior synonym and the valid name for Oliva nitidula Duclos, 1835. Oliva sidelia Duclos, 1840 is a senior synonym and the valid name for Oliva faba Marrat, 1867. Agaronia nebulosa (Lamarck, 1822) should be considered as a subjective junior synonym of A. gibbosa (Born, 1778). Agaronia nebulosa auct. consists of two distinct species; the valid name for specimens from Sri-Lanka and India is Agaronia junior (Duclos, 1840). The type material of Oliva petiolita Duclos, 1844 and Oliva tisiphona Duclos, 1844 is not in line with the specimens we currently know under these names and should be considered as nomen dubium. The valid names for these species are Olivella esther (Duclos, 1835) respectively Oliva obesina Duclos, 1840. Amongst recent authors (Tursch & Greifeneder (2001), Sterba (2004), Hunon et al. (2009)), there has been discussion of the validity of several species. As part of this study, I conclude that Oliva pindarina Duclos, 1840, Oliva timoria Duclos, 1840, Oliva neostina Duclos, 1840 and Oliva macleaya Duclos, 1840 should be considered as valid species. There are several heterogeneous type lots in the MNHN and therefore lectotypes for Oliva lepta Duclos, 1835; Oliva olorinella Duclos, 1835; Oliva stelleta Duclos, 1835; Oliva azemula Duclos, 1840 and Oliva galeola Duclos, 1840 are designated. Some brief biographical notes are added. RAVEN, J.G.M. & RECOURT, P., 2018. Notes on molluscs from NW Borneo. 4. Olivoidea (Gastropoda, Neogastropoda), with the description of eight new species. A first inventorisation is made of the Olivoidea from NW Borneo, covering Neogene and present-day. The area has a rich fauna with 41 extant and 14 extinct taxa, to which undoubtedly others will be added as several areas, environments and formations remain undersampled. Eight new species are described, one extant (Olivella hyalina) and seven extinct (Miocene; Oliva balteata, O. bekenuensis, O. curta, O. telescopica, Olivella microstriata, Amalda acutapex and A. miriensis). For the extant species the discussion focuses on differences with populations from other areas. For the extinct species more detailed descriptions are given. Oliva hanleyorum Petuch & Sargent, 1986, O. mindanaoensis Petuch & Sargent, 1986 and O. staleyi Perini, 2011 are considered valid species; O. raderi Petuch & Sargent, 1986 is considered a valid subspecies of O. neostina Duclos, 1840; O. intricata Dautzenberg, 1927 is considered a subspecies of O. mantichora Duclos, 1840 and O. labuanensis Marrat, 1871 is considered a subspecies of O. multiplicata Reeve, 1850; O. angustata Marrat, 1868, Olivella lanceolata (Reeve, 1850) and Olivella micula (Marrat, 1871) are forgotten species that are reintroduced; O. indomalaysica Petuch & Sargent, 1986 (non O. indomalaysica auct. = O. cf. 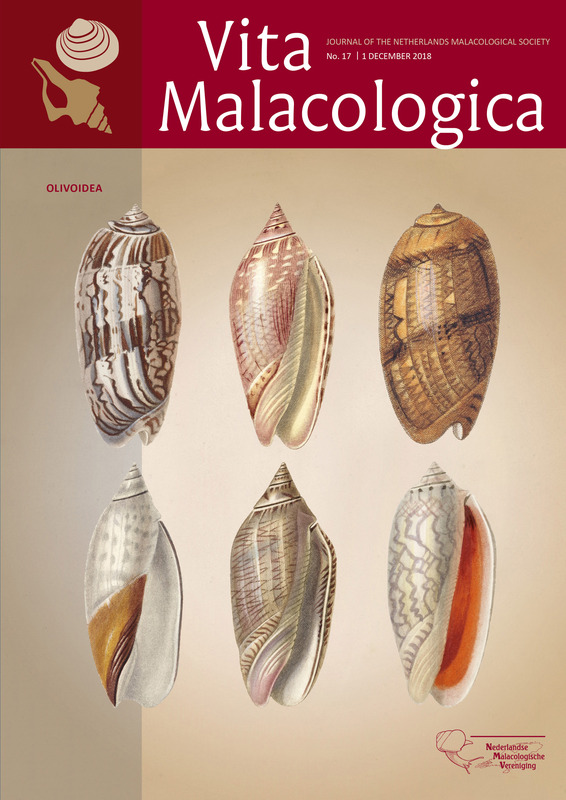 angustata Marrat, 1868) is considered a synonym of O. hanleyorum; the forgotten species Oliva ozodona Duclos, 1835 is reintroduced by Vervaet (2018) in this issue of Vita Malacologica and included in this paper; and a lectotype is selected for Oliva cylindrica Marrat, 1867. Type locality. — Beraya-Tusan seaclifs, km 1.1-1.2, Sarawak, Malaysia. Middle Miocene, Serravallian. Type locality. —Kampong Tengah turnoff outcrops 1.4L & 1.4R near Bekenu, Sarawak, Malaysia. Middle Miocene, Langhian. Type locality. — Beraya-Tusan seaclifs, km 3.60, Sarawak, Malaysia. Middle Miocene, Serravallian. Type locality. — Kampong Tengah turnoff outcrops 1.4L & 1.4R, Bekenu, Sarawak, Malaysia. Middle Miocene, Langhian. Type locality. —Tanjong Lobang, Miri, Sarawak. Type locality. — Temporary outcrop at Kampong Keriam, Jalan Tutong simpang 545, Tutong, Brunei. Middle Miocene. Type locality. — Ambug Hill, Tutong, Brunei. Late Miocene. Type locality. — Beraya-Bekenu road km 28.5 left. Middle Miocene.